This is a another exceptional watercolour from the J. Barrie Haste collection. 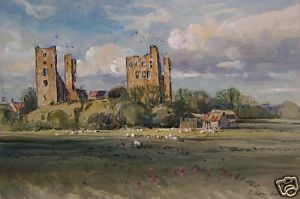 This very well-respected West Yorkshire artist spent a great deal of time painting scenes from the Yorkshire countryside; this one is no exception and captures a typical country scene with the old ruins of the castle in the background. It was likely painted in early Summer. It depicts one of the many old castles still visited by many historians and tourists, hence its title 'Sherrif Hutton Castle'. The image measures 23cms x 34cms approx and is supplied with a hand-cut waterline mount using Artcare mountboard to help protect the painting from deterioration, enabling the purchaser to frame as required. The border surround adds about an extra 5cms to each side. It is signed by the artist at the bottom right-hand side. Verso signed by the artist and dated.